Are you searching for copier rental in Utah? Well, you've come to the right place! Your business needs various essential equipment to truly thrive. This includes a range of electronics, such as copiers. If you're interested in renting a copier for your business, you have various options from which to choose. Copiers of the past typically served the sole purpose of making copies, but today's machines are able to provide much more value than that. They can sort and staple copies, thus saving tremendous amounts of time and effort, compared to doing those tasks by hand. Even better, many current copier models offer specialized services such as image editing. 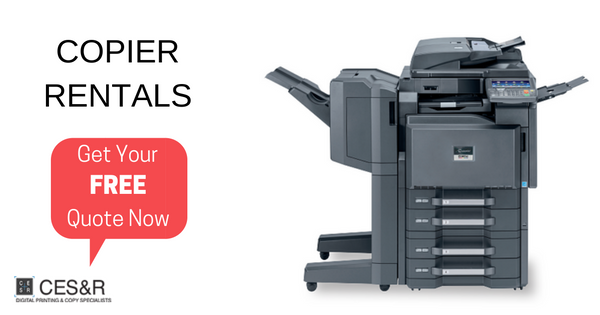 CES&R offers copiers from KIP, Canon, Copystar, and more. There are multiple compelling benefits or renting a copier. For one, you can bring on board the latest in technology and keep up with features that suit your copying needs without having to invest large amounts of money buying a "latest and greatest" copier every time you turn around. Better yet, you can typically do this for a much lower price than what you'd spend to buy this type of state-of-the-art equipment. You will find a substantial difference in how much you're spending when you rent from CES&R Printing Services. Our unique pricing structure means you simply pay one fixed price that includes the actual copier equipment, plus everything else you need to be up and running, such as the tone and copy/print paper. This saves you the hassle of needing to keep supplies like toner and paper stocked at all times. Better yet, the price includes servicing in case the copier needs maintenance or repairs. CES&R Printing Services has a large and fully trained service staff, so when you need service, we will be at your location promptly to keep you up and running at all times. There are no up-front costs involved in getting set up with our excellent copier rental program. How Much Does It Cost to Rent a Copier? All businesses have budgets, so it's important to know how much needs to be allocated toward copiers. Various factors will determine what type of equipment you'll need and therefore how much your copier rental will cost. These include whether you need black/white or color copying, the finishing options you need for your printing jobs, the number of pages you print weekly or monthly, whether you need high-speed printing, and the length of time you plan to rent your copier. If you know you're ready to rent a copier or are still in the information-gathering stage, we are happy to tell you about the variety of copiers we have for rent. We can help to accommodate your unique requirements and budget, so please contact CES&R online or call us at 801-487-8715. We are here to help you reach your business goals by investing in equipment that meets your specific needs.